Tips to make your Tailgating experience the best it can be. 2.3 E-2 Lights, Captains, Action! CNU Football 2011 - First Season Under the Lights! 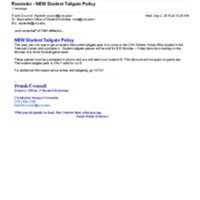 Email regarding new tailgate policy for students.